Katherine Hanks, left, and Stephanie Martin are co-owners of Annie Hanks Ceramics Studio on Main Street. They often produce functional pieces but, along with Shadow May, are hosting a show of fine art, "Convergence," through Dec. 23. "Convergence," a show at the Annie Hanks Ceramic Studio on Main Street, will feature works by Katherine Hanks McAlister and Stephanie Anne Martin, examples of which are shown here, and fellow potter Shadow May. Diners at a couple of restaurants already have seen — and used — their functional ceramics. Now a couple of local artists have opened an art gallery to showcase more of their work. 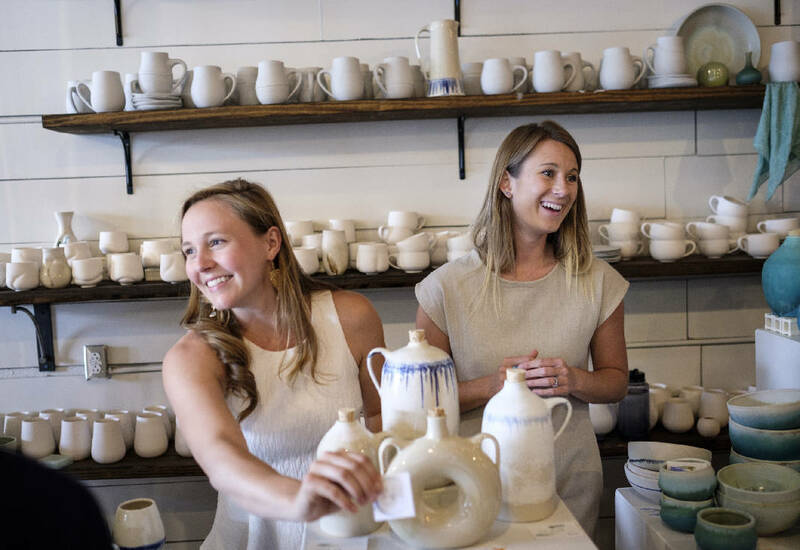 "We're moving from functional art into more fine art," says artist Katherine Hanks, 27, who co-owns Annie Hanks Ceramic Studio with friend Stephanie Anne Martin, 30. This month, they're hosting a show along with Shadow May, a local potter and sculptor. They will still sell functional art like coffee mugs and plates, but this show will focus on fine art. Hanks, 27, and Martin, 30, call the show "Convergence." 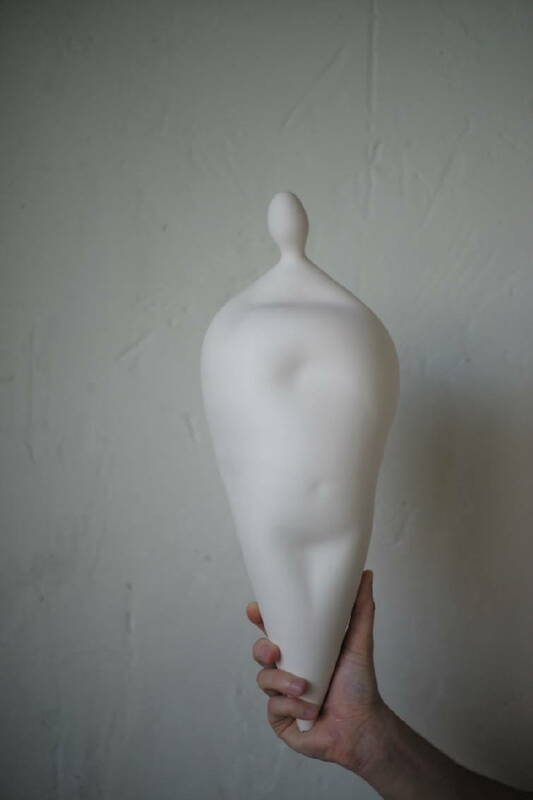 "We're working with raw clay, unglazed ceramics and highlighting form," says Hanks. "The more feminine form, curves and intersecting lines." › What: “Convergence” art show. › Where: Annie Hanks Ceramic Studio, 1810 E. Main St., Suite 100. › When: Through Dec. 23. Open 11 a.m.-5 p.m. Tuesday-Friday. The fine-art show, which continues through Dec. 23, will highlight the contrast between masculine and feminine. May's work is very big and masculine, Hanks says, while hers and Martin's are more soft and tender, feminine and elegant. To ready their space for the show, Hanks and Martin put up extra lighting to better showcase the designs, and Martin decorated the wall with an 8-foot-long sculpture. Their fine art sales start at $400, says Hanks. Coffee mugs and other smaller pieces start at $35. "It is all very thoughtfully made between the design and the glaze," she says. Martin and Hanks started their relationship as neighbors. They soon became friends, discovered they both appreciated ceramics and opened the art studio together. Martin worked in property management but longed to do more with her hobby of ceramics. Hanks studied art and majored in photography at the University of the South in Sewanee, Tenn., where she graduated in 2012. She came to Chattanooga and taught preschool, but missed art. "It's like the most vast art form," she says. "I mean it's literally ancient. You could be in ceramics your whole entire life and only scratch the service." The Wild Flower Tea Shop on Market Street is among the businesses that use Annie Hanks Ceramics in their establishments. "We made all the serving pieces, the tea cups and tea pots, everything they serve off of at Wild Flower Tea Shop," says Martin. They also supply dishes for Plus Coffee in St. Elmo and the Scenic City Supper Club, which brings in guest chefs for pop-up dinners around the city four times a year. Contact Yolanda Putman at yputman@timesfreepress or 423-757-6431.